Mixtape for a Rainy Day - Using Opentape! Having just found out about Opentape a couple days ago, I finally had a few minutes today to try it out. So far, it's incredibly simple and easy to use. I haven't read through the codebase yet [Editor's note: bad developer, bad!] so it might be full of horrible security holes, but until I find them, I'm very happy. The setup process took about a minute (if that), and once I uploaded my songs I was ready to go. So I don't really have a lot to say about getting it up and running, which is good. Instead, I offer you this mix I made of songs inspired by my friend Kate's question "what do you listen to when it's raining?" I realized that the answer could be completely different tomorrow or the next day or the next, but here's a few songs I listened to on this rainy day. Enjoy! I don't like that version of "Sunken Treasure" as much as the one from I Am Trying To Break Your Heart, but I don't have that one. Oh, well. 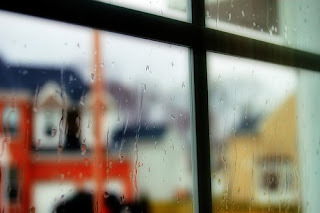 So...what do you listen to on rainy days? Also, does the mix stream smoothly for you? What do you think of the interface? Hat tip to Rugg for pointing me towards this interesting piece on Lifehacker about Opentape, a PHP-based web app (that you run yourself on your own server) that lets you host your own mixtapes, similar to the recently disappeared Muxtape. I haven't had a chance to install it and try it out yet, but never fear, I will do so soon. Anyone else tried this thing yet? Is it cool? I stumbled on The Hood Internet recently from the Last.FM page for Broken Social Scene's "7/4 (Shoreline)" [Editor's note: the "7/4" in the title refers to the time signature, which makes the music geek in me light up inside]. I wanted to share the song with some people and this seemed like good way to do it, since nowadays Last.FM offers free full tracks for a large portion of their library. While I was on there, I read the comments people had posted about the song. One of the commenters had posted a link to a beautiful mashup of this song with R. Kelly's "I'm A Flirt." I listened to it about 4 times in a row before getting back to something productive. I also took a little time to check out The Hood Interent's site, and in the process learned that they have a huge collection of free mashups available for download on their site. And most of them are pretty good. Steve Reidell and Aaron Brink, the DJs who comprise The Hood Internet, hail from Chicago and used to be in a rock band together there. You can feel the love for both indie rock and hip-hop in their mashups as each genre tends to get equal footing in the songs as opposed to one being used for a punchline. "Shoreline" is my favorite of theirs I've heard so far, but I've been impressed by nearly all of them. Do you have a favorite mashup? Well, it finally happened. 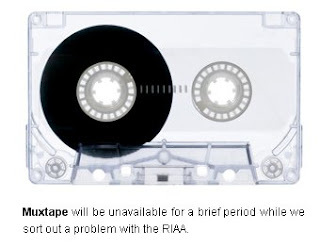 The RIAA somehow got wind of Muxtape, and has apparently forced the site to shut down for a little while. According to Muxtape's official blog, "No artists or labels have complained. The site is not closed indefinitely. Stay tuned." That sounds pretty ominous to me, despite the upbeat tone. 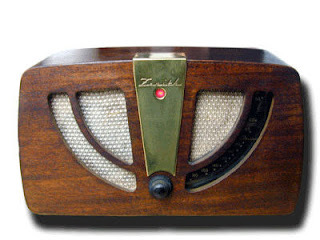 This is sad news indeed, right on the heels of Tim Westergren of Pandora indicating that the dreaded internet radio royalty rate hikes may soon bring about the demise of Pandora. Of course, Tim has been saying things like this for a while, but it seems like it's more serious these days, as their appeal options are running out. Fortunately, Mixwit hasn't been taken off the air yet, so enjoy it while it lasts... But first, check out my writeup of Mixwit. So what can you do? The people at SaveNetRadio are encouraging online listeners to call their representatives and let them know that you think killing online radio is a bad idea. So what are you waiting for? Go do it! I haven't looked too deeply into this yet, but I was very excited to read on DCist (hat tip to Amanda of Creative DC) that famed DC label Dischord Records has made their entire catalog available for download in the form of 320 kbps DRM-free MP3s. It's not FLAC, but I'm not ready to complain. Yet. Anyone plan to download anything? Instead of having to type in your bands like Tourfilter, or having it scan your iTunes library, like SongKick, SonicLiving scans your Pandora & Last.FM profiles once a week to look for artists that you like. I'm not sure what algorithm it uses - if it's your most listened to artists on Last.FM, or only artists you've thumbs-upped [Editor's note: what's the right way to conjugate that?] on Pandora, or maybe artists you used to seed a station, or what, but whatever, its cool. It can scan your iTunes library if you want it to, but I like that it gives me these other options since I hate iTunes. They email me about every 5 minutes telling me about shows. I'm exaggerating, but only a little. They do email me a lot. I can change that in the preferences, but for now it's kind of cool to get all these reminders about bands I probably wouldn't have bothered to type into Tourfilter (hello, Grizzly Bear!). The Last.FM integration is definitely handy when I add new bands to my collection and start listening to them, but forget to add them to Tourfilter (bands like The Dodos and Cut Copy, for example, both of whom are apparently coming to DC in September). Anyone else signed up for this thing yet? I haven't been able to post as often as I'd like the past couple months, first because I was out of town on a couple vacations, and lately because I've been extremely busy with work, improv, and all the other things I do to fill my days. However, the work-related busy-ness is what got me thinking about posting today. I am never not listening to music when I work. Usually for me "work" == "computer programming," [Editor's note: that double equals sign is not a typo, it's a programming convention to signify equivalency as opposed to variable assignment. Anyone still awake at the end of that sentence? Great.] 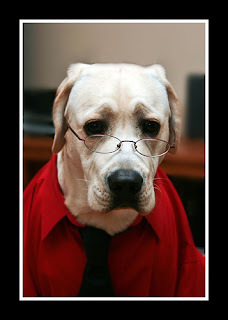 but sometimes it can mean doing detective work, i.e. reading through a year's worth of some other programmer's notes (not to be confused with actual documentation) and trying to figure out how the hell this thing that I have to work on A) actually works, and B) is actually supposed to work. When I'm doing normal, day-to-day programming, I listen to anything and everything. Usually indie rock or hip-hop, but often jazz, classical, folk, etc., bouncing from stuff I've added to my collection lately to old favorites I haven't listened to in forever. It's a great way to familiarize myself with music I don't know all that well because I'm often half-listening to it, picking up different bits each time through. So I end up "familiar" with new stuff, and a sense of whether or not it warrants more attentive listening. However, when I hit a really tough problem, or I have to do the aforementioned detective work (or if I have to write anything, like a proposal or a technical architecture document), I find that I simply can't afford to give half my brain an excuse to focus on the music. I really need my full attention on what I'm doing, and I need to kick in the old booster rockets. For many people, that would require total silence around them. For me, it requires A) music I know really well, and B) music that is repetitive. Very repetitive. I love repetitive, droning music anyway (although oddly I typically hate "trance" music - I usually need words in my tunes), but when I'm using music as a tool to help me focus, there are some songs I come back to again and again. The list has changed over the years, but here's a playlist of some songs I've been using lately to help me get the most out of my brain. What do you listen to when you work? Nothing? Anything? Different stuff? PS For the record, this time the imeem upload & playlist creation (& playlist editing) process went extremely smoothly. They seem to have worked out their issues. I've been working at home a lot more since I became a freelancer earlier this year. For one of my clients, I spend most of the day connected to their VPN network. They don't use a standard VPN, instead they use software from a horrible company that used to manage my former company's IT. The point is, when I'm connected to their network, I can't access my NAS, which means I can't listen to any of my music when I'm working at home for this client. Obviously, this blows. Lots of exposure to new bands. Really dig the focus on nerdy, music theory-based recommendations. Very simple interface, easy to create new stations and edit existing ones. Rating songs can throw your stations completely out of wack. Song selection can sometimes be just plain terrible, or I get too long a stretch with nothing I know. It can do too good a job and everything ends up sounding the same over a long period of time. Really easy to start a station. Song choices are very "comfortable" - never straying too too far from stuff you probably already know (this is also a drawback). Desktop player has a really nice interface and it's easy to see artist information. Free membership doesn't come with "your radio" - the one where it plays you stuff based on all your past song-playing history. Not enough exposure to new bands. Music selection is pretty good - nice mix of stuff I know and stuff I don't. Ability to customize your stations and ban certain artists or include certain artists. Ability to set how "familiar" you want the music to be - i.e. very close to your seed artists or farther away. The interface is confusing and inconsistent. Despite claims to the contrary, I couldn't turn off their stupid "DJ" who kept cutting in to tell me how great the Slacker portable player is. Not enough range in bands - I heard the same bands over and over again on some stations. With all of the above, you can customize your stations and settings to various degrees to address some of the "Nots" I listed, but I focused primarily on how they come out of the box without doing a lot of setup work. When those tools wear out their sonic welcome, I often turn to woxy.com (thanks to Catherine Andrews for turning me on to this) which usually does a great job of keeping my ears happy for several hours at a time. What do you listen to online? Do you use one of the big 3 tools I talked about? Do you have a favorite online radio station? What do you listen to during the day?